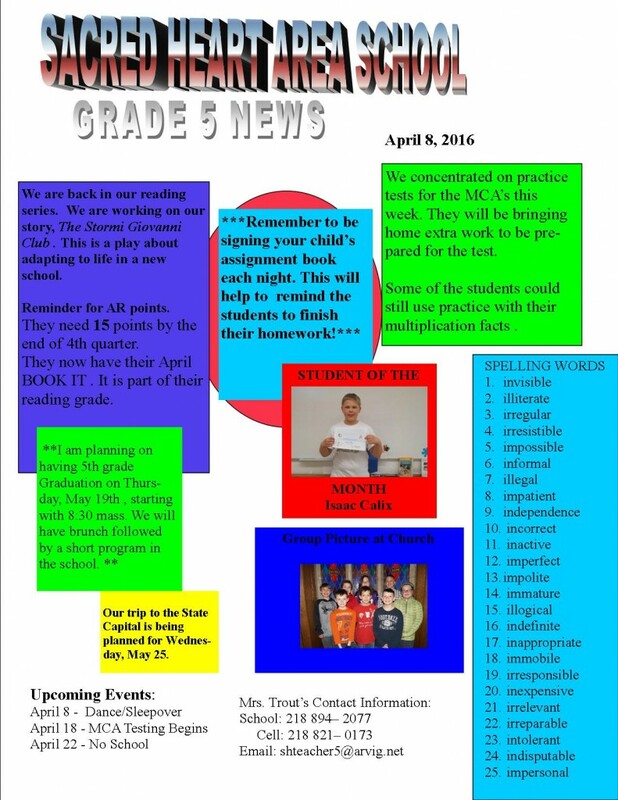 Thank you for visiting the 5th grade News page. If you are new to our school, be sure to check out our ABOUT US page. If you would like to learn more , visit our 5th grade class tour. Here we are in the fourth quarter already! We have been working very hard at our daily studies. In math, we are becoming proficient in division with 1 and 2 digit divisors. In reading , all of our stories have to adapting or stretching. We are working on the early explorers in Minnesota History. The students are learning many new idea about our state. Here we are the midpoint of the third quarter already. Where does the time go? The fifth graders have been working very hard on their daily studies. We are nearly finished with the novel, Brian’s Winter. They are enjoying this book very much. As part of their assignment, after several chapters, they predict what is going to happen next. In math we have been working on fractions. They have watched videos, done worksheets, and played games to become familiar with different types of fractions. We are now moving on to measurement. We learned about the first white men to come to Minnesota, in history class. Their purpose was to find furs to sell to France. They are becoming more familiar with lakes and rivers in Minnesota, as we work on our map skills. We are now in the season of Lent, so our religious activities have been geared around preparing for Holy Week. We have had fun with I Love to Read month. It is great to see them reading so much! I just want to give a huge thank you to everyone who helped to make the Christmas Program such a success. It was such a joy to hear all of the beautiful singing and have the message of Jesus’s birth renewed in our hearts! We started our OLPA testing this week. We will finish next week. In Religion we have been talking about Epiphany, as the Christmas Season comes to an end. In social studies we are learning about how European explorers were trying to find an easier route to Asia. Did the Vikings come to Minnesota??!? We are rapidly coming to the end of second quarter. Please check with your child to see if they have all of their AR points! Hello from the fifth grade. It is unbelievable that we have almost finished the first quarter of school. I am so proud of the fifth graders. They have worked very hard to be successful at all the skills we have been working on. In math, we are working on multiplication and division. We are using a variety of ways to master their multiplication facts, including laptops, IPads, flash cards and math games. We have been having a great time in reading class. We began a novel, Trouble River, on Tuesday. The story has been keeping them on the edge of their seat, waiting to see what will happen next! They are learning about foreshadowing and how to make connections from the book to their own lives. We are thankful for our two grandmothers who have been helping out in our classroom, Mrs. Japke and Mrs. Hanson. The students practice their spelling words, reading out loud, and on Friday’s they have been learning a life skill, journaling. This is helping to bring their family history to life. In Religion, we are working on the 7 sacraments, along with that, we having been working on prayers and the Beatitudes. Our days seem to fly by! The past two weeks have just flown by. We have had so many exciting activities going on. 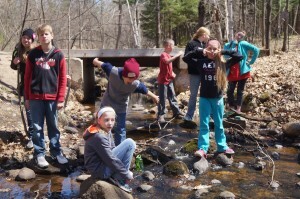 We spent three days at the Audubon Center of the Northwoods at Sandstone, MN. This is an over night environmental camp. The students had a blast. The weather was wonderful. I believe that they even came away with some new knowledge of how to survive in the wilderness, protect wildlife in nature, and not waste our resources.We did a little agate hunting on the side. We visited the middle school to prepare for our transition to 6th grade. They met new teachers, students, and other staff members. We visited Target Field, home of the Minnesota Twins, where we took in a soggy game.On the bright side, Minnesota won!! I can’t believe that our Audubon Trip is almost here! The students are so excited to see what adventures the days will bring. They will be learning about Minnesota animals, raptors, and North Woods survival, just to name a few. We will be leaving Monday morning around 8:45. Please say a prayer to help keep us safe. The students have been working very hard to prepare for the MCA tests coming up this week. We will be testing on Thursday and Friday. In reading, they are reading a novel, Where the Red Fern Grows. Not only are they enjoying the story, but they are also learning the importance of asking God for help. In English, they are just finishing a unit on pronouns. They had to put their skills to work by writing letters to ask for money for our trip! In Minnesota History, they found out who probably really found the source of the Mississippi River. It is unbelievable that we have just finished the third quarter! I guess when you work hard it makes the time fly by fast. We continue to work on our Lenten promises and we present a Lenten Service to our fellow schoolmates each week. The students are now familiar with many of the explorers who came to Minnesota in the early days. They are also learning about our state symbols as we go. In reading, we are working with a story written in play form. They are enjoying acting out the characters. In math they are busy learning how to add fractions with like and unlike denominators. They have been using fraction strips to help with the process. The students will have the Mass parts next week. Here we are in the church season of Lent already. We are learning how to use this time for prayer, fasting, and almsgiving. We have been using the website, freerice.com, to not only practice our math skills, but to also help provide food for those in need. We have finished NWEA testing for February. The final tests will be in May. In Minnesota History, they have been learning about the early explorers of our state. They learned that the Falls of St. Anthony were discovered by Father Hennepin as he explored the upper Mississippi River. In reading, we are learning about people with handicaps, in particular an affliction called cerebral palsy. In math, we have been using hands on materials to learn more about fractions. We are enjoying I Love to Read Month. We spent extra time reading on our bean bags on Pajama Day. Please encourage your child to continue reading books and filling out the chart! All done with our NWEA Testing!! We will begin OLPA Testing the week of February 23. The students have been working very hard to master converting improper fractions to mixed numbers. They are doing well with this concept. We celebrated 100 days of school on Wednesday. They had many activities that were based on the number 100. Reminder – our class is on for working at the Fish fry on Friday night, February 20. Mid Quarter is also Friday. The students need to have 6 AR points by then. How are our reading logs coming? Wow!! What a great time we had over the past week! We enjoyed all of the activities and fellowship with our classmates and schoolmates. A huge THANK YOU to all those helped out with our supper and breakfast, especially those who went above and beyond the call of duty! Reminder that our trip to the Audubon is scheduled for April 27 – 29, 2015. I f you are interested in chaperoning, please let us know. NWEA Testing will be held during the next 2 weeks. We are finishing our novels and returning to our basal readers this week. We have been working very hard on mastering our multiplication facts. Welcome to a bright new year of learning! I hope you all had a restful and safe vacation. The next few weeks will be busy building up to Catholic Schools Week. We will be going to Christ The King School, in Browerville ,for a concert on January 16th. The 16th is also the last day of the quarter. We will be hosting a spaghetti supper and a pancake breakfast , Saturday and Sunday of Catholic Schools Week, to raise money for our trip to the Audubon Center. What an exciting time we have had the last few weeks. The students worked very hard on the Christmas Program. I am very proud of their efforts. I know that we brought joy into the lives of others. They had a great time making Christmas presents. They really enjoy creating projects for others. They had a blast learning how to make pie crust and later using it to make the actual pies. They are starting to realize that their math skills can be put to the test at any time! The students are very excited about the upcoming Christmas program entitled Super Gift from Heaven. Parts will be given out soon. They just finished a novel unit on the story Brian’s Winter. In math they are working dividing 3 digit by 1 digit numbers. It is amazing that we are 9 weeks into the school year. Didn’t the year just begin? We had a great time working as a school to spruce up our community. What a wonderful opportunity to show our appreciation for those who help us! In our classroom, we are reading a novel entitled Brian’s Winter. The author, Gary Paulsen, was born in Minnesota. Through the book, the students are learning about survival in the Canadian wilderness. In math, we are working on multiplying 3 digits by 1 digit. The students are using technology to sharpen their multiplication skills. They are using programs such as Xtra Math, Times Alive!, and Brain Lab. In social, they have been learning about the different tribes of Native Americans who live in the United States. They have been working very hard on their AR points. They need to have 6 points. Some have nearly 30 points!! In religion, they are learning about the parts of the mass, including the Liturgy of the Word and the Liturgy of the Eucharist. We have just passed the mid point of the first quarter of the school year. The mid quarter reports will be out next week. We had a great time on Tuesday, enjoying the great outdoors. We attended Conservation Days at Old Wadena. We visited stations that informed us about animals, nature, trees, soil, and the history of Old Wadena. The original town of Wadena was to be located on the banks of the Crow Wing River. A huge thank you to all of the grandparents who came to visit and share some time with us. We also enjoyed having the book fair here. It is always fun to get new books! Can you believe it? The first 2 weeks of our school year are in the books!! It has been so wonderful to get right to work from the beginning. We really enjoyed spending time with the Bishop on Friday. The Mass was beautiful, the food was great, and the dance was a blast. Wow, our school is 100 years old! We finished our story ” Frindle” by Andrew Clements, in reading. In math, we are doing place value with decimals. Here we are at the end of another wonderful school year . The past few weeks have been full of fun and adventure. The students went from learning about bees to learning how to fish. They spent time learning about our great state of Minnesota . They were able to experience school community by spending time at Christ the King School in Browerville sharing our talents in various competitions. I hope that you all have a safe and fun summer vacation. 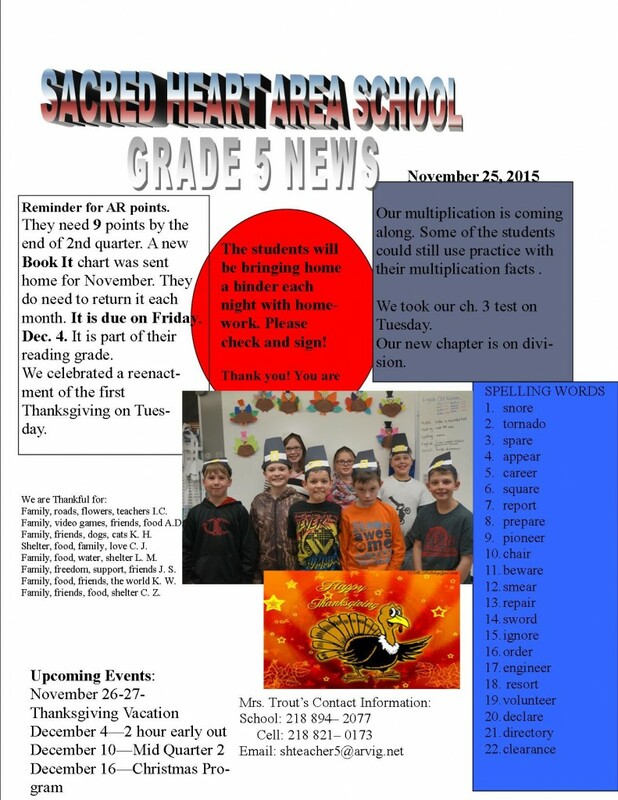 Thank you for visiting the 4th grade News page. If you are new to our school, be sure to check out our ABOUT US page. If you would like to learn more , visit our 4th grade class tour. Here we are already in the final weeks of the school year. The school day never seems to be long enough to get everything done! 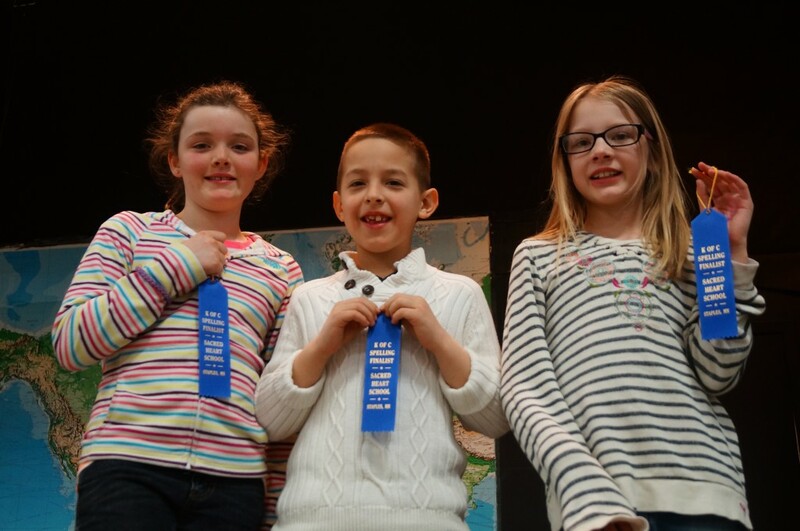 Our K of C Spelling contestants: Mary Beth Mathews, Chad Dickey & Morgan Becker. We have been working on activities that help to address the issues of prayer, fasting and alms giving for Religion. One example; most days we use the website freerice.com. We are not only helping other people in need, we are also practicing our academic skills. In math ,we have cruised through how to make, name, and measure angles. In reading, we read a story about the finding of the Lost City of Machu Picchu. To also involve geography and writing skills, we watched a video from NOVA about the finding of Machu Picchu. We then wrote about what we learned and are able to show where it is located in the world. In English, we just finished a unit on types of verbs. Reminder that we are on duty for the Fish Fry tomorrow night! Life goes on without our student teacher, Ms. Cruz. March 7th was her last day with our class. We made a book of some of the activities that were held while she was with us. We wish her a safe and pleasant trip home. We have been working very hard on mastering our basic math skills. They are getting better with their multiplication facts. It has been wonderful to have Ms. Cruz here to help with individual students. We are just finishing our novel unit on Mr. Popper’s Penguins. They really enjoyed the story. They have been putting their English skills to the test. They learned about how to use pronouns. Now, they are journaling using the pronouns. Catholic School’s Week was great. They loved all the dancing. Unfortunately it was too cold to have the sliding party. We will make that up when( if ) the weather gets warmer!!?! The students learned about standard measurement in math including inches and parts of inches, feet and yards. Then Ms. Cruz taught the students about the metric system including; millimeters, centi meters, and meters. Our theme for our classroom has been penguins. The students researched, wrote and presented their information about penguins to their classmates. They are reading the novel “Mr. Popper’s Penguins” to continue this theme. Here we are ready to begin another Catholic Schools Week. Just a reminder that the students have jobs to work on this weekend. The Spaghetti Supper is after the 5:00 Mass in Staples and the pancake breakfast is after the 10:30 Mass in Motley. Many exciting events will be happening in the next week including: dress up days, s’mores, dances and community time with other Catholic schools. It has been wonderful to have an extra helping hand. Ms. Cruz has been doing a great job of jumping right in and helping where it is needed. She even helped the students make necklaces for our Monday dress up day. As you can feel, the new year has brought us more cold weather. Our vacation was extended just a little longer. Our new student teacher also began her first day enjoying our cold temperatures. Her name is Ines de la Cruz. She is joining us from Madrid, Spain. She will spend the next 9 weeks learning about our school system. The fourth graders always seem to stay very busy. At the end of the day, they often say”Is it time to go home already?” Christmas Program practice and making Christmas presents have been uppermost on their minds. We have managed to squeeze some academics in also. We just finished reading a story about a young man who works as a bookkeeper in a northern Minnesota logging camp. In math they are learning how to solve equations with variables. Of course in religion, they have completed many activities helping to prepare them for the birth of Jesus. Happy Thanksgiving from the Fourth Graders! The past few days we have been busy with community service projects. One such project was for the Centennial Committee. The students decorated donation boxes with ideas for new playground equipment. In social, they were excited to be reminded that the mighty Mississippi River has it’s humble beginnings right here in Minnesota. They were amazed by how big it gets as it flows into the Gulf of Mexico. In math we have been working on fact families and simple division. We had a great time swimming at the Community Center. This was our prize for making the Marathon goal. They are a bunch of little fish!! Yesterday the fourth graders visited the Care Center. They helped with the Halloween Party for the residents. This was one of our community service projects we perform throughout the year. The students have been busy practicing how to make change with different amounts of money. They have been working in groups to help each other master their multiplication facts. They have been practicing reading out loud to a partner, to help with their comprehension and listening skills. The students have been studying about the Southwest in social studies. The Grand Canyon was one of the main features they learned about. The end of the quarter is Friday, November 1. Conferences are on November 7, 2013. Welcome to the 2013 – 2014 fourth grade class site. The 9 fourth graders have been working very hard to get into a new routine. The students used the laptop computers to research and report on a sea creature of their choice. Our classroom theme is ” Under the Sea”. They have been working on place value in math. In English, they are working on subjects and predicates. NWEA Testing started this week. Please make sure your child is getting plenty of sleep. Thank you to all of the Grandparents and friends who came to visit our school and classroom! We were able to visit the Centennial Auditorium on Friday, May 2. We checked out the art being displayed at the Rotary Art Show. NWEA testing will be starting this next week for the fourth and fifth graders. Our field trip to the Cities will be on Friday, May 17. Hooked On Fishing will be held on Saturday, May 18. Sorry for the slow update! The fourth and fifth graders completed their MCA Reading Test today. Their brains were spinning as they read and answered questions. In our reading class, they have been reading stories that fall into the genre of expository non-fiction, meaning that they are provided with factual information about a topic. The fourth graders learned about pink dolphins. They completed the unit by researching and writing reports about these fresh water dolphins. Both classes have been working on fractions in math. They are able to add and subtract with common and unlike denominators. The fourth graders will have an opportunity to go fishing on Saturday, May 18, as part of the ” Hooked on Fishing , Not drugs” program. 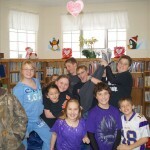 The fourth and fifth graders completed their first round of MCA (Minnesota Comprehensive Assessment) Testing. They were tested on their math skills. In social, the fifth graders are busy learning about their great state of Minnesota. They are currently working on a report about a state park of their choice. They have learned many interesting facts about the early people who lived in Minnesota. Religion has been devoted to learning about Holy Week including the people and events that occurred during this holiest of times. 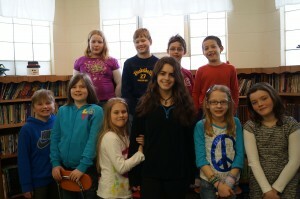 The fourth graders have completed their novel unit. They are working on games to review the events in the story. The fifth graders had a great time working on and playing the games they created. Both groups have been working on their multiplication facts. They have been doing time tests, X-tra Math on the lap tops, and Education City. We had the K C Spelling Bee on Thursday night. Congratulations to Rose Han, Cole Winkels, Lynnzie Dukowitz, Thomas Koval, Jack Tyrrell, and Ryan Wick. 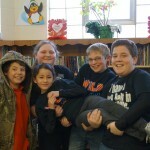 The fifth graders have finished reading their novel, The Best School Year Ever. They are in the process of creating games to review the events of the story. They have been having a great time with this. The fourth graders are almost finished with their novel, Mr. Popper’s Penguins. In math, fifth graders have been working on factorization and common factors. The fourth grades just finished a chapter on division and are continuing with division of larger numbers in their new chapter. We have been participating in many Lenten activities to help prepare us for Jesus’ death and resurrection. 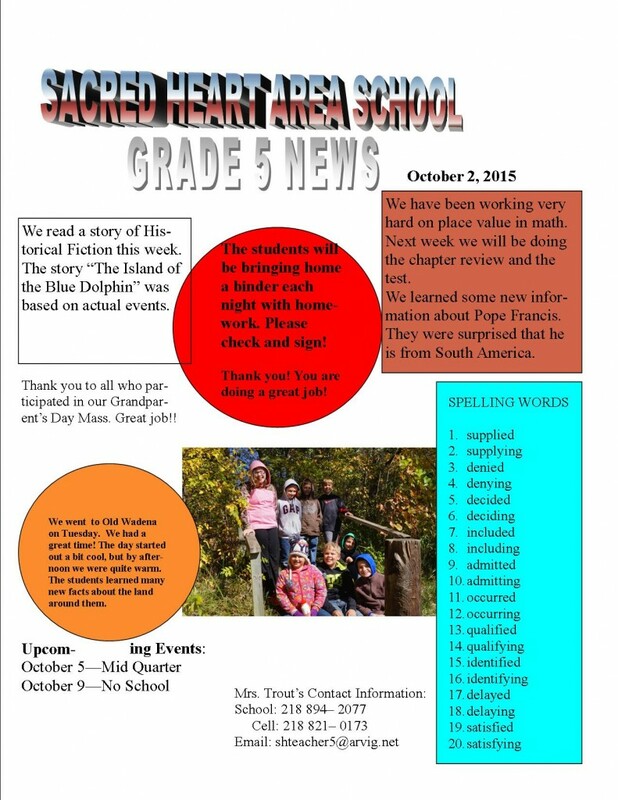 Thank you for visiting the 4/5 grade News page. If you are new to our school, be sure to check out our ABOUT US page. If you would like to learn more , visit our 4/5 class tour. The beginning of the new year brought us a new student, Rycker Beckner . Although new to the 4th grade, he is not new to our school. He attended here through 1st grade. To celebrate the month of January, we learned about Martin Luther King Jr. ,as well as, researched and reported on penguins. Each grade is starting a novel unit. We just finished our NWEA testing. In math, the 4th grade is working on division. The fifth graders are working on mean, median, mode and range.